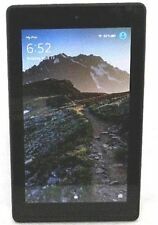 Samsung Galaxy Tab 4 SM-T230 8GB, Wi-Fi, 7in - Black. This is a used tablet. Because it is used it may show signs of wear on the screen as well as the housing. The tablet may also have glue residue from stickers on the back housing. This tablet is used but has been cleared, tested, is fully operational and functions as intended. Because it is used, there will be signs of wear throughout, such as scratching, scuffing, and other like blemishes. 7" Android 4.4 Wifi Tablet. Video Format : 1080P(1080 x 600 resolution) Full HD Play. 1 x Tablet PC. Flash : Flash 11.0 Support. Data Interface : USB HOST 2.0 high speed interface (Micro),Support Extra Hard Disk, Ethernet, 3G Dongle and other peripherals. Its 8GB storage capacity provides enough room for your favorite movies, music and photos, but it can also support up to 128GB with the Micro SD Card reader. With Wi-Fi capabilities at 802.11b/g/n, the 736TPC lets you stay connected with family and friends via the Internet. IPad, iPhone, iPod, Android, Smartphone, Tablet, PC, etc. Built-in Bluetooth Technology for Wireless Data Streaming. Compatible with All Your Favorite Bluetooth Devices. 1.2GHz Cortex A13 Processor Chip with 3D Graphic Acceleration. This is a used kindle.There will be several scratches on the screen. Because it is used the front and back housing has moderate wear due to it. The kindle has been tested and cleared, so it is works properly. Apple iPad Pro 10.5", 2nd Gen, 64GB, Wi-Fi, Rose Gold, 3D119LL/A🔥🔥🔥. Accessories Included iPad Pro Tablet/ Lightning to USB Cable/ USB Power Adapter. Condition of units is Grade B 8/10. Units have been tested and inspected by certified technicians. Model Family Apple iPad Pro. Color Space Gray. Touch ID fingerprint sensor. Lightning to USB Cable. We reserve the right to cancel your order, if it does not pass verifications, or seems fraudulent / suspicious. Apple iPad 2 64GB, Wi-Fi, 9.7in - Black. This iPad is used and is in good condition. It has been cleared and tested and is fully operational and functions as intended. Because it is used, the screen has a crack down the middle of screen. Front facing speakers makes viewing videos and music much enjoyable. AMPLE STORAGE SPACE - Fusion5 104 Tablet is loaded with 32GB of Internal Storage. 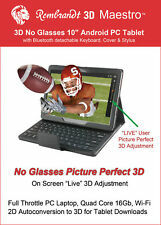 Tablet pc is perfect for multitude of uses. Further storage can also be added via a micro SD card (Supports upto a 128-gb TF-card). New ListingApple iPad Pro 10.5 inch (WiFi Only) Tablet A1701-64GB-PLEASE READ!!!!! 10.5” - 64GB . IPAD ONLY . SPACE GREY . Trending at $444.50eBay determines this price through a machine learned model of the product's sale prices within the last 90 days. 3X model D01400. May or may not have a cracked or broken screen. LCD may have dead spots. (iPads that wont power on may also have iCloud turned on. ).